Definition at line 1899 of file CCopasiXMLParser.h. 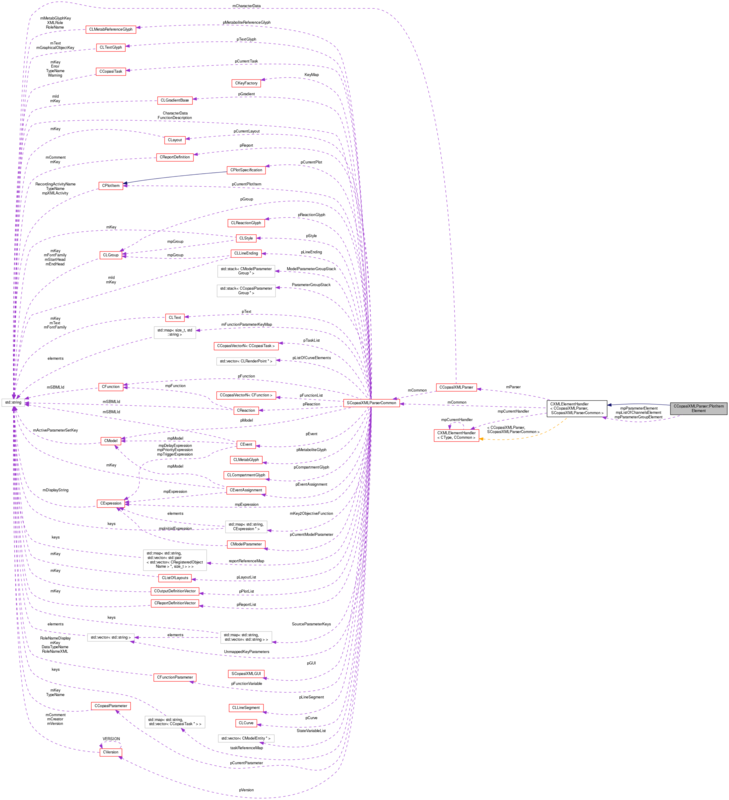 Definition at line 1906 of file CCopasiXMLParser.h. Definition at line 5777 of file CCopasiXMLParser.cpp. Definition at line 5786 of file CCopasiXMLParser.cpp. Definition at line 5882 of file CCopasiXMLParser.cpp. References CCopasiParameter::BOOL, CCopasiParameter::CN, CCopasiParameter::DOUBLE, CCopasiMessage::EXCEPTION, CCopasiParameter::EXPRESSION, fatalError, CCopasiParameter::FILE, CKeyFactory::get(), CCopasiParameter::getKey(), CCopasiObject::getKey(), CCopasiObject::getObjectName(), CCopasiParameterGroup::getParameter(), CCopasiParameter::getType(), CCopasiParameter::getValue(), CCopasiParameter::GROUP, CCopasiParameter::INT, CCopasiParameter::INVALID, CCopasiParameter::KEY, SCopasiXMLParserCommon::KeyMap, CCopasiXMLParser::mCommon, MCXML, CExpatTemplate< CExpat >::mParser, CCopasiParameter::Value::pBOOL, CCopasiParameter::Value::pCN, SCopasiXMLParserCommon::pCurrentParameter, SCopasiXMLParserCommon::pCurrentPlotItem, pdelete, CCopasiParameter::Value::pDOUBLE, CCopasiParameter::Value::pFILE, CCopasiParameter::Value::pINT, CCopasiParameter::Value::pKEY, CCopasiParameter::Value::pSTRING, CCopasiParameter::Value::pUDOUBLE, CCopasiParameter::Value::pUINT, CCopasiMessage::RAW, CCopasiParameter::setValue(), START_ELEMENT, CCopasiParameter::STRING, CCopasiParameter::UDOUBLE, CCopasiParameter::UINT, UNKNOWN_ELEMENT, and SCopasiXMLParserCommon::UnmappedKeyParameters. 5904 //TODO warning if type mismatch. Is silently ignored currently. Definition at line 5793 of file CCopasiXMLParser.cpp. 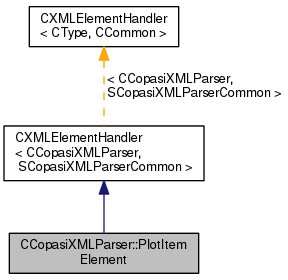 References CPlotSpecification::createItem(), CCopasiMessage::EXCEPTION, CCopasiXMLParser::mCommon, MCXML, CExpatTemplate< CExpat >::mParser, SCopasiXMLParserCommon::pCurrentPlot, SCopasiXMLParserCommon::pCurrentPlotItem, toEnum(), UNKNOWN_ELEMENT, CPlotItem::unset, and CPlotItem::XMLType. The line number the unknown parameter was encountered. Definition at line 1932 of file CCopasiXMLParser.h. Definition at line 1927 of file CCopasiXMLParser.h. Definition at line 1917 of file CCopasiXMLParser.h. Definition at line 1922 of file CCopasiXMLParser.h.